In this article, I'm going to summarize everything about Glo, Airtel, 9Mobile, MTN Hourly YouTube data plans and their subscription codes. Without further ado, read complete article for MTN, Glo, Airtel, 9Mobile Hourly free YouTube streaming data plans and subscription codes for any device. These free YouTube streaming data plans can be used on Android mobile, PCs, Laptops, Tablets, and iOS devices even the iPhone X! But I'd like to start with the most updated ones which are Glo free YouTube plan that I recently posted on this blog. Click the above link to read full details about the new Glo YouTube streaming data offer while we discuss the remaining networks right here. Let's go! MTN have added a new pocket saving internet plans to their list of data plans which is the MTN Hourly YouTube data plan, but it's basically a data subscription that allows you to stream movies on YouTube for a specific period of time. This latest MTN hourly data plan seems to have been launched secretly since nobody knows it has been in existence before now. These plans come in two classes, among these classes; we have 1-hour plan (750MB for #150) and 3 hours plan (2.2GB for #400). So you have the options to either subscribe to a 1-hour plan or that of 3 hours plan. The MTN 1 hour and 3 Hours Unlimited YouTube Streaming packs have different prices and data volume for you to enjoy unlimited YouTube streaming on any device. 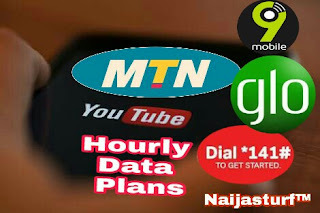 Why you need to use this time-based data plan is that it's pocket-friendly, and instead of using your normal MTN monthly data subscription I recommend this one for you. Remember I said it's not unlimited, it has data usage limit. You can subscribe to a video pack plan and enjoy video streaming or download on YouTube by dialing this mtn night plan code *131*8# to go to the data data service menu and select from the hourly data (mtn night browsing data bundle) of your choice. To subscribe to the 3 hour YouTube Video Pack, dial *131*8*2# that's all on mtn night plan activation code, subscribe and enjoy! Dial *559*18# to know about your remaining data balance. The 9Mobile Free YouTube streaming is the simplest one as you would be automatically rewarded with the YouTube data bonus when you buy any data bundle of N500 or above. This 9Mobile free YouTube streaming data offer to work smoothly on any type of device, no eligibility required, it doesn't select SIM it works for everybody and you too can enjoy it! Something you should know about this 9Mobile YouTube data offer is that, it's capped 2GB data volume, this means you're allowed to stream YouTube daily from 1 am to 5 am without touching your active monthly data sub. Dial *200# from any phone and select 3 for data option and pick any data plan of your choice as from N500 and above in the data menu and then you get to enjoy this offer once it's 1:00 am till 5:00 am. If you are a 9Mobile regular subscriber and have not been using this feature on the 9Mobile internet service, you're missing out something. But now I think you know! The Airtel unlimited night pack code come in different categories, which are: YouTube plus packs, YouTube weekly and monthly, and YouTube night packs. Please do have it in mind that these data plans can only be used to watch YouTube videos but on any device. You can subscribe to any of these airtel SmartSPEEDOO YouTube packs by dialing *323# and select any of the YouTube Video Packs of your choice. 5. YouTube Plus 5.0 - 19GB for N4,000 *323*35# - 1 month. 9. Airtel YouTube Night Monthly - 600MB for N200 - *323*21# (7 days) that's all on how to deactivate airtel night plan. To check your YouTube data balance on Airtel, simply dial *140#. That's all, enjoy your hourly YouTube data, watch football matches, stream movies whole night!. For glo night YouTube streaming Click Here.